Since the tragic Marathon bombings in April, “Boston Strong” has become part of the vernacular. The victims and their families have all been admirably positive and strong. The Boston Police, Fire Fighters, EMTs, regional responders, volunteers and observers at the finish line who selflessly rushed to help the injured were strong. The extraordinary doctors and nurses in the Boston hospitals who worked tirelessly to save limbs and stem the death toll were strong. In the face of this first act of terror on American soil since 911, the President, Governor, Mayor and a multitude of public and private individuals led the response with unprecedented unity and strength. Children and young adults who have severe neurological impairment, and their families, deserve to know we support them through their ordeals, too. JP was a ward of the state when Alexia Vaun Hefflyunn became his education advocate four years ago. 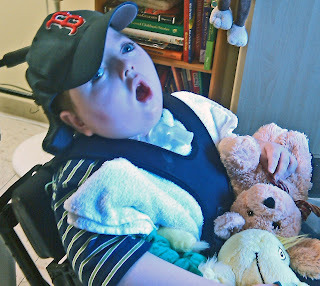 He is a non-verbal, non-ambulatory, medically-fragile seven and a half year old who has resided at Plymouth Rehabilitation and Health Care Center (formerly Radius) in Plymouth MA since he was a toddler. She is a full-time administrative manager working in Boston, living in Plymouth and studying for a business degree. J.P. wears his favorite Red Sox cap often. Many compassionate people generously give their time to others. In this case Alexia became so devoted to J.P. that she became his legal guardian for life. Federal education law mandates that parents or guardians participate in the education decision-making process for students with special needs. When family is not involved, trained volunteers from Massachusetts’ Special Education Surrogate Parent Program are matched with children to monitor their progress and advocate for their needs. “I was drawn to him immediately. It surprised me,” said Alexia, who represented two other children previously. “I come from a family with a tradition of caring. I’m the kid who smuggled stray pets home. People in my department call me Mom and come to me with their problems . . . There are a lot of nurses in my family, and I was very tempted to become one . . . but in the end I chose not to go into that kind of profession because I am so deeply affected by people,” Alexia said. She fell in love with J.P. She began visiting him most weekends, helping him with hand over hand activities, and joining him in organized programs such as a trip to the barn. Her dedication did not go unnoticed. Linda White, education director at the Athena Day School at the center, observed that Alexia went beyond insuring her student received an appropriate education program. She became invested in helping him live the best life possible. After several years, J.P.’s social worker asked Alexia to consider making all of J.P.’s decisions. “In my heart he had already become my family,” she said, so in August 2012 she became his legal guardian. In the months since she has experienced both joys and challenges. The medical decisions are the worst, she says. Despite the best doctors in the world, each time J.P. goes into the hospital, she doesn’t know if he will come back. To learn more about being Special Education Surrogate Parent please visit www.sespprogram.org or your state’s Department of Education. Record keeping is critical in health care, but very time consuming. Skilled Nursing Facilities, including pediatric facilities, are discovering it takes less time to update charts and review patient care when they change to paperless documentation. 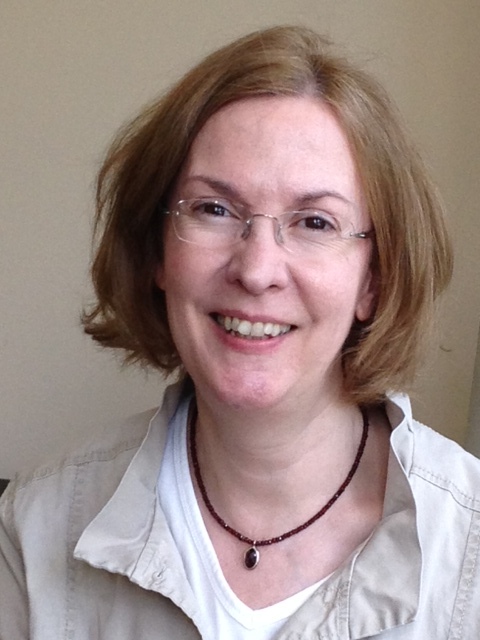 “Less time on paperwork means more time for quality care,” says Jennifer Morgan, RN, BSN. As Staff Development Coordinator she oversees training and the transition to Electronic Health Records (EHR) at New England Pediatric Care in N. Billerica, MA. Reporting is quicker, she noted, because a series of questions pops up to record progress, level of assistance needed and condition changes. “We get a clear snapshot of what’s been done immediately. It’s easy to tell what chart you are in; and there is no difficulty deciphering handwriting,” Jen said. Staffers use unique user names and passwords to access secure records and their automatic signatures on entries ensure accountability and accuracy. NEPC’s system currently color codes Activities of Daily Living: “to do” is yellow; completed jobs are green; red means overdue, Jen explained. Soon the system will similarly display changes in medications and treatments when an individual’s chart is called up. For the past two years Cedarcrest Center for Children with Disabilities in Keene, NH has been using kiosks and an integrated medicine cart to enable real time charting of meds, vitals, and activities of daily living at the facility. Recently, following an evacuation drill, administrators decided to modify its software system to allow remote access to records, according to Jeff Fuller, Director of Development and Community Relations. “We are working in conjunction with the pediatric clinic practice at Dartmouth-Hitchcock Keene to work out the protocols and technical issues to make remote access possible for on-call and emergency situations,” he said. Seven Hills Pediatric Center in Groton, MA started using a simple version of EHR in 2004, and is in the process of moving to updated software. Certified Nursing Assistants have been making reports on the new software and the rest of the staff will move in the fall, according to Holly Jarek, Vice President and Executive Director. Note: All nursing homes are required to implement electronic records by 2014. Molly and Kaitlin share a happy moment. When Molly F’s care got tangled up in state government regulations, H.A.L.O. CAN was able to help. “We made sure this child got the care she was entitled to under the letter of the law,” said Rebecca Dalpe, a law partner at Foster and Eldridge and volunteer with H.A.L.O.’s Children’s Advisory Network. The story began when Molly and her twin sister Kaitlyn were born at 34 weeks. Molly was diagnosed with CHARGE Syndrome, a complex, life threatening genetic condition. 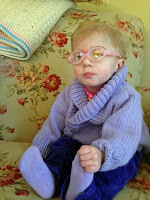 Molly is legally blind, wears hearing aids, and receives nutrition through a feeding tube. Over a 13-month period, she underwent five surgeries. Eventually she was able to transfer from the hospital to New England Pediatric Care (NEPC) in Billerica, MA for short-term, skilled nursing while awaiting further surgery. “The doctors wanted to get her up to full strength before taking her trach(eotomy) tube out. It was important to do this as soon as possible so she wouldn’t miss the developmental window for speech,” said Bob, Molly’s dad. Unfortunately, it took longer than they had hoped. Frequent aspiration put Molly at very high risk for pneumonia and twice in three months she experienced respiratory distress and had to be rushed from NEPC to the hospital. Molly’s pediatric otolaryngologist, Mark A. Vecchiotti M.D. wrote that it was imperative for Molly’s health and safety that she be closely observed by skilled medical staff to be well enough to proceed with surgery and to preserve her best chances to develop speech. So the family was shocked when the state’s Medical Review Team (MRT) refused to approve an extension of Molly’s stay at NEPC. 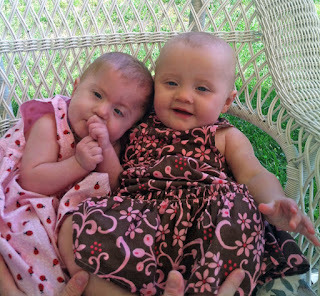 Bob said the family would have been hard-pressed to give Molly the intensive care she needed at home because of Molly’s complex issues and caring for twin sister infant Kaitlyn. Molly is home with her family. So Rebecca worked with the distraught parents to obtain support from Molly’s surgeon and to file an appeal that highlighted Molly’s fragility and her need to be in good health for the difficult surgery. The effort was successful. Molly got the care she needed, had the surgery on December 18th and is now happily home with her sister and parents. “Molly would not be at this point without your help,” Bob said in a note to Rebecca and H.A.L.O. “As parents we were afraid. We knew Molly would need lots of support in the future, and we didn’t know the system. I don’t know if Molly ever would have had her surgery without help from Becky. Thank you,” said Bob. Volunteer lawyers at H.A.L.O. CAN help families understand and file forms at appropriate times, obtain legal advice in matters affecting their child’s care, and provide emergency legal services when necessary. Seven Hills Pediatric Center in Groton, MA is reaping benefits from having a medical director who is also a nationally-recognized expert on palliative care for children and young adults with severe neurological impairment. “Most people think of palliative care as end-of-life care, and it can be, but in the pediatric population is also about how to enhance their days,” says Julie M. Hauer, M.D. Since becoming Medical Director in 2011, Dr. Hauer has conducted staff workshops to strengthen identification of pain and discomfort. This has resulted in symptom improvement, increased awareness and reduced spasticity in at least a third of residents, she said. “Dr. Hauer’s knowledge in this developing field has improved quality of life for our residents, who have profound impairment and complex medical needs,” said Holly Jarek, Vice President and Executive Director of the long term care facility. Families sometimes face difficult decisions about surgery or painful treatment options for their child. Dr. Hauer makes it a priority to be available to address questions and concerns. She discusses benefits and risks from a palliative perspective, so they can make informed choices that provide the best possible life for their child. Dr. Hauer’s credentials include two years as a primary care pediatrician, 14 years treating children with neurological impairment at Gillette Children’s Specialty Healthcare in Minnesota, and later directing its pediatric palliative care program. 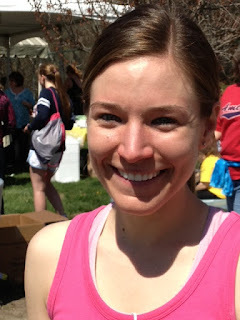 She currently holds a faculty appointment in the division of general pediatrics at Boston Children’s Hospital where she also completed a fellowship in pediatric palliative care. As medical director she is responsible for the health of 83 residents. Visit www.sevenhills.org/affiliates/pediatric-center to learn more about the center. 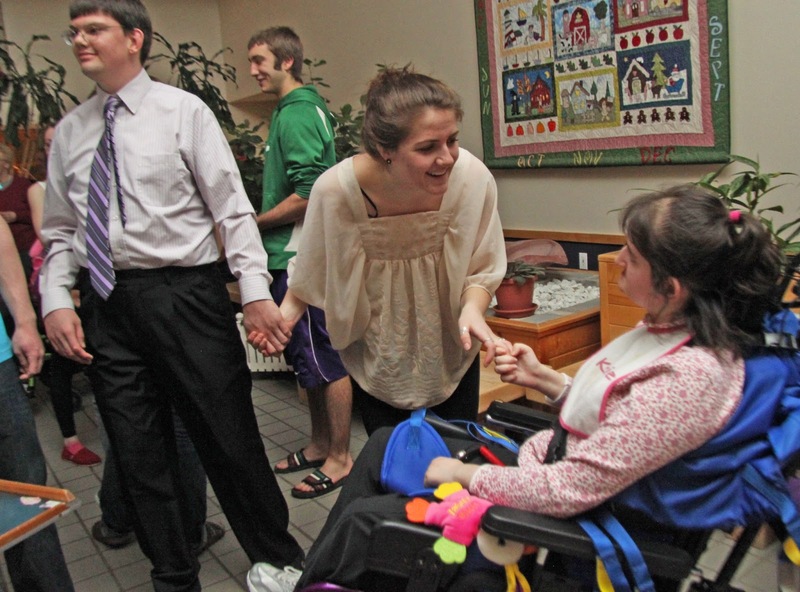 Students from the Interact and React clubs at Keene (NH) High School recently sponsored a dance for residents at Cedarcrest Center For Children With Disabilities. The clubs raise awareness and acceptance of students with disabilities in the teen community and provide mentoring partners and opportunities to increase social skills. They are operated by Rotary International and work with Monadnock Developmental Services, a regional state agency.